Hotel Waldstein is situated in the most attractive part of Prague, few steps from Charles Bridge, Old Town Square and surrounded by Prague Castle and the main Prague sights. 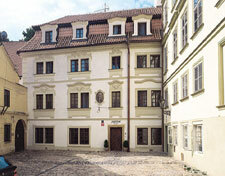 Waldstein is situated in the most attractive part of Prague, few steps from Charles Bridge, Old Town Square and surrounded by Prague Castle and the main Prague sights. The Historical building (14th century) offers accommodation in 34 rooms and suite comfortably equipped with antique furniture, bathroom (shower or bath, WC), complimentary toiletries, flat TV/SAT, direct dial phone, hair dryer, in-room safe deposit, minibar, WIFI connection and tea & coffee making facilities free of charge. Some rooms have original wooden renaissance ceilings. The reception desk is available to guests 24 hours a day and offers drinks, money exchange services, sightseeing tours, excursions, ordering of taxi, laundry and other services. Parking in a guarded yard in front the hotel (available for extra charge). Internet point free of charge is available in the lobby. Hot buffet breakfast is served in a beautiful renaissance vaulted cellar with an original well. During summer, clients can relax in a pleasant atmosphere of the hotel atrium. Cordial and attentive multilingual staff is available to assist you during your stay with any needs that you might require.